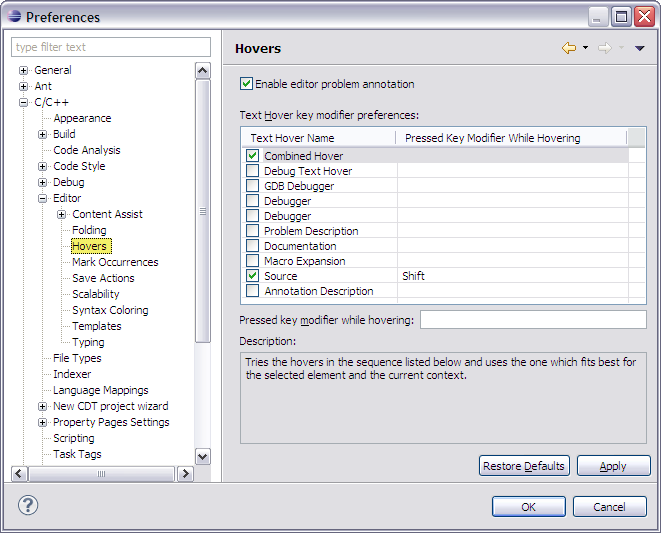 Use the Hovers preference panel to customize the C/C++ editor hover behavior. Enable editor problem annotation When selected problems found will be highlighted in the editor. Text Hover key modifier preferences You can select hot-keys to enable alternate hover behavior. For example, a mouse over while pressing the <Ctrl> key will link to the element's source declaration. Pressed key modifier while hovering Enter a key modifier for the selected hover name.